Halloween’s a few weeks away! It’s an election year! Your costume choices are clear! So who are you going to go as? Just curious, though: By dressing as him for Halloween, will you be making fun of him…? Or supporting him…? No, no, wait! Don’t answer that! This isn’t a political blog! It’s none of my – none of anyone’s! – business! But I just think it’s kind of interesting you’d automatically go for the white guy. No, look, it’s totally cool. It’s all in fun, white? I mean – it’s all in fun, right? Nothing wrong about choosing the white guy. Picking the white guy over the black guy doesn’t make you “racist!” C’mon! We’re all sophisticated people here! 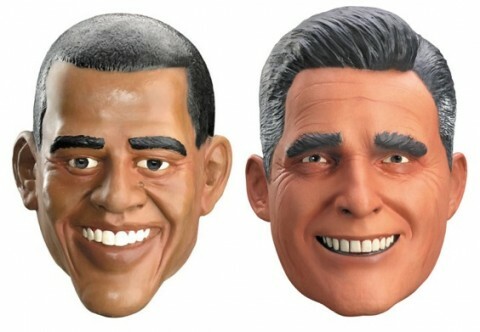 You want to go as Romney, go as Romney! Have some fun with it! Hey, no big deal. Just because apparently you refuse to buy the other mask. Because the mask of the black guy isn’t good enough for you…! No, no, go for it – get the white mask! I’m sure it’s not the first time you’ve put on a white mask. …What? Really! You’ve changed your mind! And decided to go as Obama! Interesting! Hey, whatever, it’s your decision. Doesn’t matter to me who you go as. It’s Halloween – a time for having fun, right? 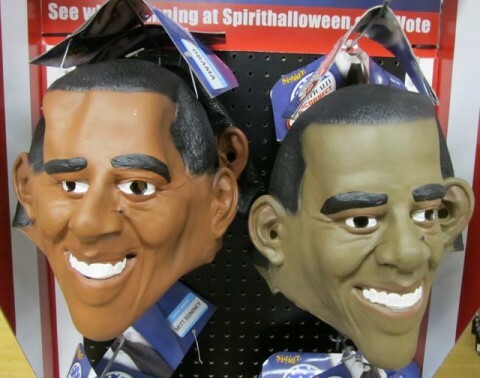 Anyway, let’s get you that Obama mask. Go ahead. Pick one out. We’re all very interested to see which one you choose. Posted by Ted on October 3, 2012, 1:42 AM.